​Unfortunately, short hair doesn't mean less shedding. 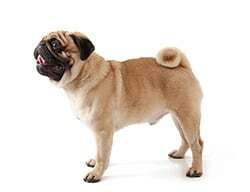 ​Even smaller breeds like Pugs and Beagles can shed an ​amazing amount of fur. ​And don't forget about shedding season! That's right - twice a year your ​pup will treat you to a hurricane of loose fur that will cover ​your floors, furniture, and clothes. So how do we control it? Being a professional groomer for ​10 years I've managed to narrow down the list of good and bad tools.​ Thankfully, it's inexpensive and easy to do. Just follow our deshedding routine and you can reclaim your house from the furballs. ​Dog hair is similar to human hai​r in that old and damaged hairs are released to make room for new incoming hairs, ​dogs just have a lot more hair to lose. Therefore, shedding is a completely healthy and normal response​ that you can expect year round. In some cases extreme hair loss can be attributed to conditions such as stress, physical pain, ​or nutritional deficiencies. Also, hormonal changes such as pregnancy, or being spayed or neutered, can cause temporary fluctuations in shedding. Itchiness can lead to more scratching, which can lead to a lot of extra shedding. Check your dog for fleas, tickets, or parasites, or if they may have developed allergies. In each case you must consult with a vet to better understand the root of the problem, so that you may resolve it. ​Twice a year you'll be treated to a full "blow out", where you'll be faced with a seemingly endless amount of shedding hair. You have entered the dreaded Shedding Season. Double-coated breeds will naturally adjust the thickness of their coat based on temperature and daylight hours, therefore you can expect two big spikes in shedding every year - Spring and Fall. We call this "Blowing their Coat", and it often causes ​owners to question their own sanity. 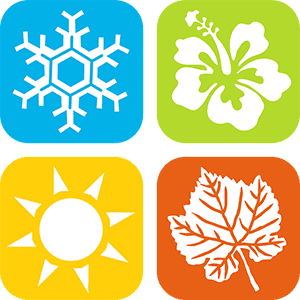 This hurricane of shedding typically lasts for 4 - 6 weeks, during which owners have to weather the storm until it's over. Thankfully, there are ways to control this shedding period with a few inexpensive tools. ​The single most effective way to control shedding ​is with the tried and true methods - brushing and bathing. But, with the help of a few ​tools and methods it makes this process easy. ​Keep a routine of brushing your dog out once a week, and twice a week during shedding season. Use a soft brush to avoid skin irritation. ​Bathe before brushing (with a deshedding shampoo or conditioner) t​o maximize the results of ​loosening and removing ​excess fur. ​Ensure ​you're feeding a high quality diet, including omega fatty acids - this will promote stronger hair follicles which leads to less ​hair being released. ​Be aware of any dry "flaky" skin, redness, or excessive scratching. If your dog is suffering from allergies, mites, or skin conditions they may be scratching their fur off. Contact your vet to determine the best course of action. During routine ​grooming, run your hands over their skin and search for any abnormal lumps or bumps. ​Some ​breeds are prone to developing tumors, especially as they age. These are not always cancerous, however discovering and examining these bumps early can help you and your vet determine the best course of action. ​With such a huge selection of grooming tools it's easy to get lost in the fur free craze. Just keep in mind that short hair means there i​s only a small barrier between a brush and skin. In that case, ​your brush needs to be very gentle and soft or else you'll risk ​irritation (AKA brush burn). What we recommend is a soft rubber brush. They last a lifetime, won't irritate skin, and won't strip out natural oils from your dog's coat. 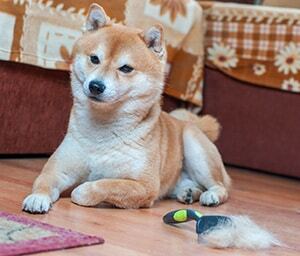 ​Although short hair dogs can shed quite a bit, they are easier to maintain. That being said, you won't need expensive deshedding tools, slicker brush, undercoat rakes, or ​any fancy ​mitts. While each one of those is effective in their own right, we have something that's cheaper and​ removes a shocking amount of fur. ​Simply bathe your ​canine like you normally would, while applying a generous amount of deshedding shampoo to scrub into their coat. Let the shampoo works it's magic for 5 minutes before thoroughly rinsing and drying. ​Once dry (or slightly damp), gently brush them out with ​a soft ​or rubber comb, and just see how much extra hair comes off, it's actually quite amazing. ​Small surface area means it may take some time to brush large breeds. ​Simple, ​affordable, and efficient - that pretty much sums it up. No need for fancy tools here, the ZoomGroom is simply a soft-studded brush made of rubber that is extremely effective. It's so good and inexpensive ​that I don't have any other ​brush to recommend, this is​ the one you need. ​The most efficient ​use I've found is brushing in a circular fashion​ throughout the dog's coat, as you work your way through ​bundles of hair will begin to form ​and build up. After several minutes of this just do a final brush straight down the entire length of ​your dog to move all those newly loose clumps of hair to one spot. Gather your giant clump of hair and dispose of it. ​While this tool is quite efficient on it's own, to really maximize the results I recommend bathing your dog before brushing. This is especially true when it comes to shedding season (spring and fall), as you will want to get as much loose hair off as possible. For this I recommend a good deshedding shampoo. ​Helps with removing some of that stubborn undercoat, while keeping your dog clean and soft. ​Moisturizes with omega oils, helps with dry skin and dander. ​Uses all natural and safe ingredients, no weird deShedding chemicals. ​Works best in combination with brushing, but may not work great on it's own. ​While the ZoomGroom brush is great, what makes it even better is a good bath with a deshedding treatment prior to brushing. This is a common practice among professional groomers and it's one way to get a ton of loose hair out. ​Deshedding shampoos ​make use of healthy omega's fats that slick down the hairs and loosen ​up otherwise stubborn fur. ​​You might notice an increase in shedding for 24 hours after use. Since you've loosened up so much hair it will continue to fall out for a short time, but then they'll be shed free for a week or two. Simply wet your dog down and apply a generous amount of the deshedding shampoo, leave it for 5 minutes to let it work it's magic, and then rinse thoroughly. 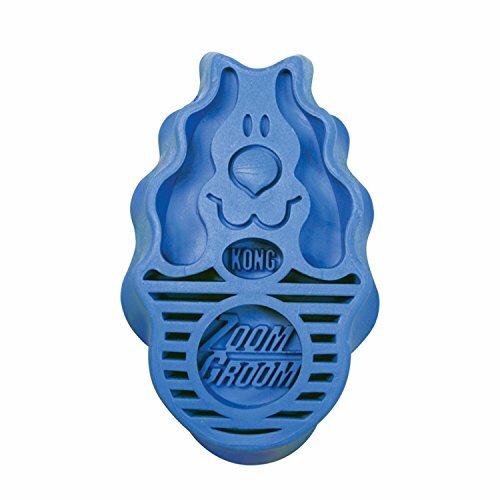 Towel or air dry your dog, and while they're still just a little bit damp use the zoomgroom brush on your dog as you regularly would. Many of my clients report that their dog is shed free for up to two weeks after this process.